I hope you are ready for some Christmas crafts because I am ready to share some with you! This year I was DETERMINED I would get it fixed and hung! Here it is hanging on my mirror in my dining room! I love the red, green, and brown together! My Christmas dishes have red and green in them and the brown ties in with the brown walls. Tidy Mom made this one from Dollar Store ornaments! I love your wreath!! 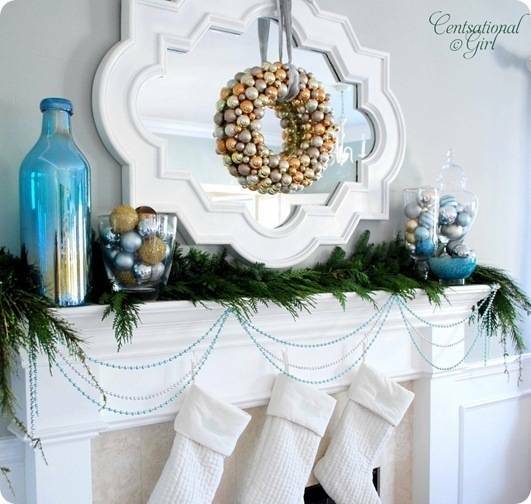 I'm still working on lots of my Christmas decor, so haven't had time to blog about it! Hopefully I will before Christmas rolls around! Btw, I was reading a post about free photo cards for bloggers on Southersavers.com and one of the "sample" cards, looks like you and your hubby!! I was looking on my phone at the time, so maybe it isn't but it sure looks like it!! Omg, that's what I get for commenting about something I looked at 3am this morning while feeding my baby! It was on your page, lol! I was reading my google feed with all the posts mixed together! Ha! Totally ignore this sleep deprived mama! So pretty! I was just looking at my mantle thinking it needed something on my mirror - enter your ideas! : ) Can't wait to give it a try! Thanks! oh, and I saw you put some ornaments in a three tiered dish in your dining room! LOVE LOVE LOVE!! The wreath is just so unbelievably pretty! It just screams Christmas! And it just is just perfect hanging on the mirror, really. 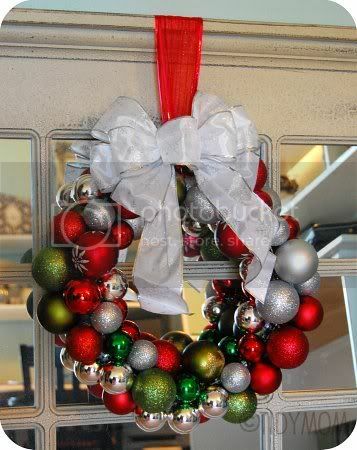 I'm not the craftiest person ever but I would like to have something like that at home - is it possible to buy a similar wreath somewhere? I don't think I have ever seen it in any store. I have not seen them for sale anywhere either. Although I have heard of people finding them at Goodwill or maybe a TJMaxx type of store. Just be brave and make your own - you can do it!! :) Then share your pictures with me!